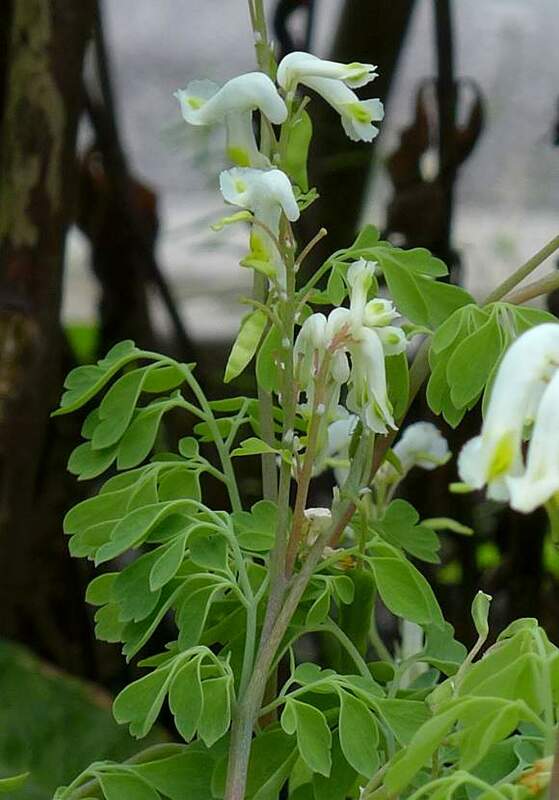 Somewhat similar to Climbing Corydalis, but it doesn't climb, has much larger flowers which are yellowish green near the end. It is a non-native which occasionally escapes from gardens. This specimen has yet to make a break for it... 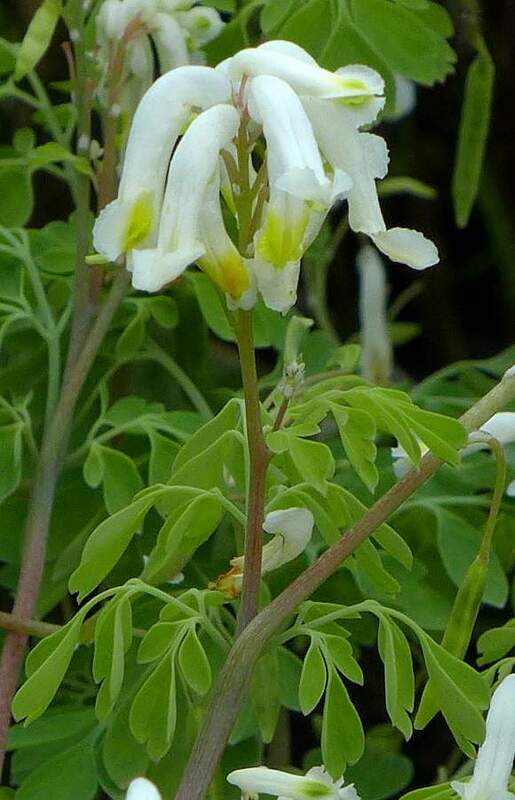 It has an upright stance, rather than floppy and sprawling like Climbing Corydalis. It has a short flowering spike at the summit, and fawn stems somewhat similar in colour to those of Dandelion (except that these branch). 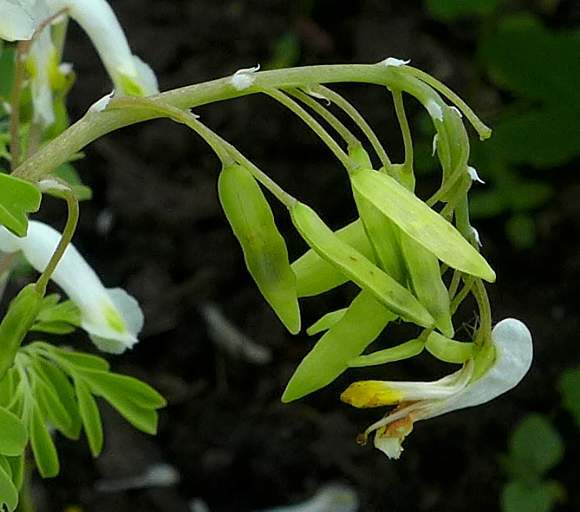 The flowers are similar also to those of Fumitory s, to which it is related. 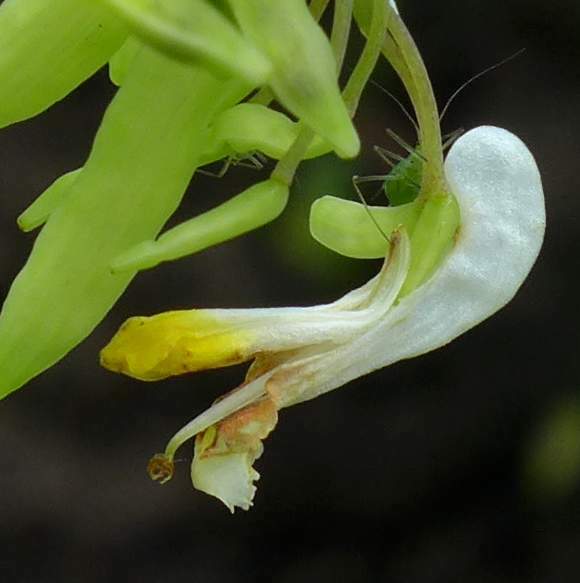 The flowers have a long narrow tube, which is bent near the summit - the (rather short) nectar tube (spur) at the rear. The two petals are diametrically opposite each other, membranous, and slightly wider and curled. 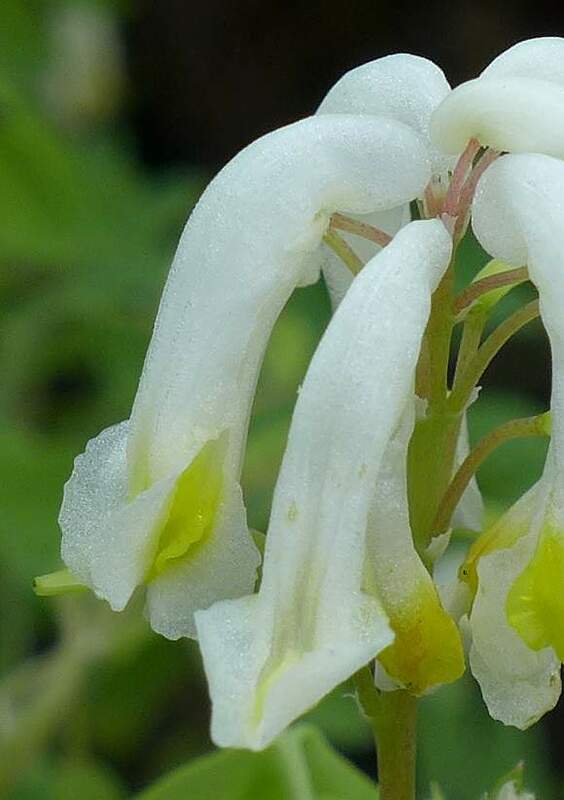 The inner part of the flower is shorter than the petals and yellowish-green at the tip. 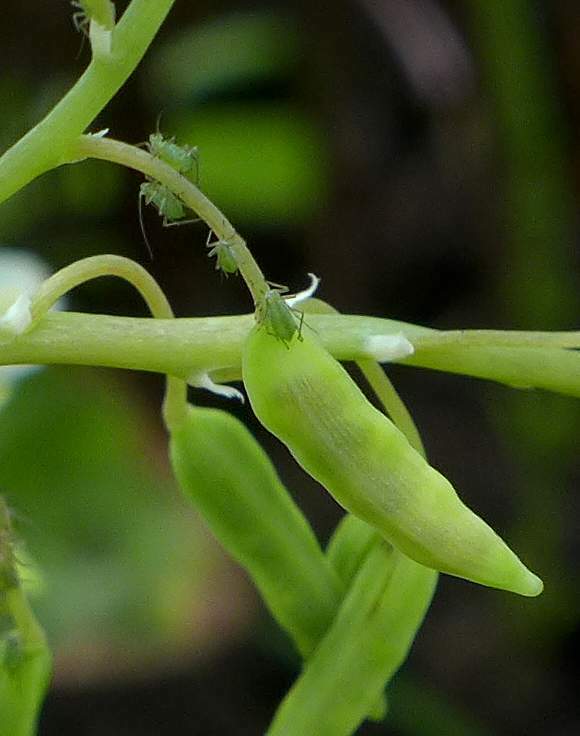 the flower stalks (petioles) flex under the weight of the flower (when both it and the following fruit have vacated the petiole straightens up. Most of the flowers on this part have dropped off whilst the flat, ship-shaped (pale-green) fruit/seed pods develop. The stigma sticks out of the mouth. 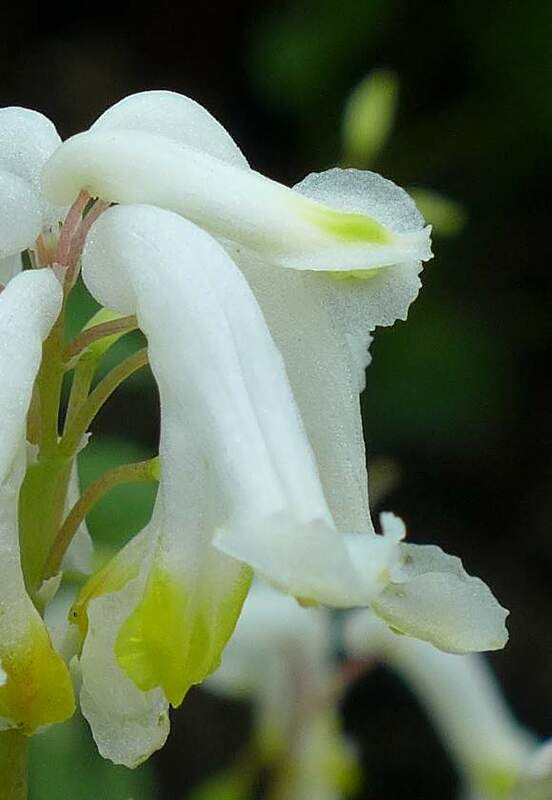 There are two short green flaps under each flower. Aphids on a drooping petiole now supporting the fruit/seed pod. The slight lumpiness of this one suggests about 4 seeds are developing within. After the pods have also dropped off the petioles straighten up (top part). 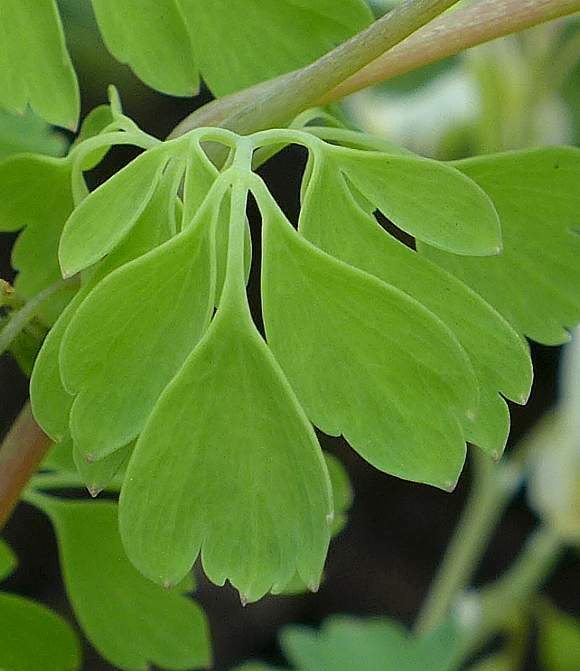 Leaves irregularly lobed with 2 - 4 or more lobes and are reminiscent of those leaves of some Meadow-rues such as Lesser Meadow-Rue or to Maidenhair Fern. Leaves are grey-green and quite thick as are the pale fawn stems and both look as though they are succulent. 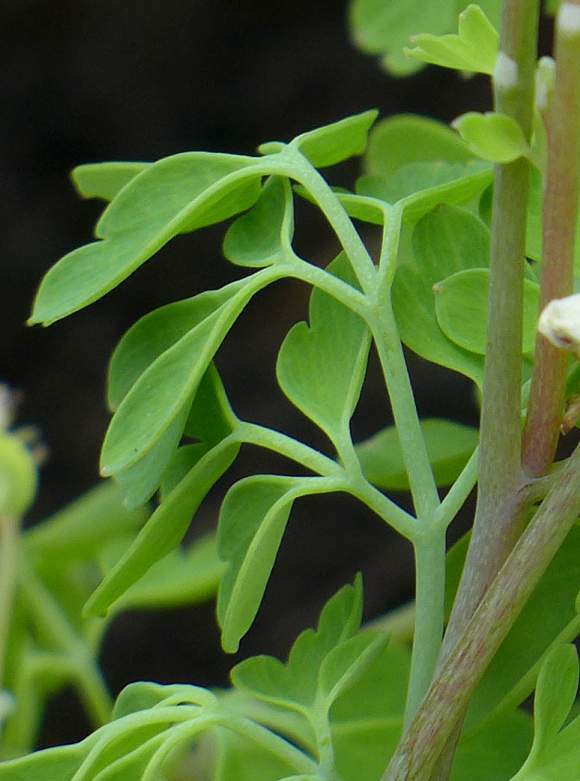 The short bi-pinnate nature of the leaflets. 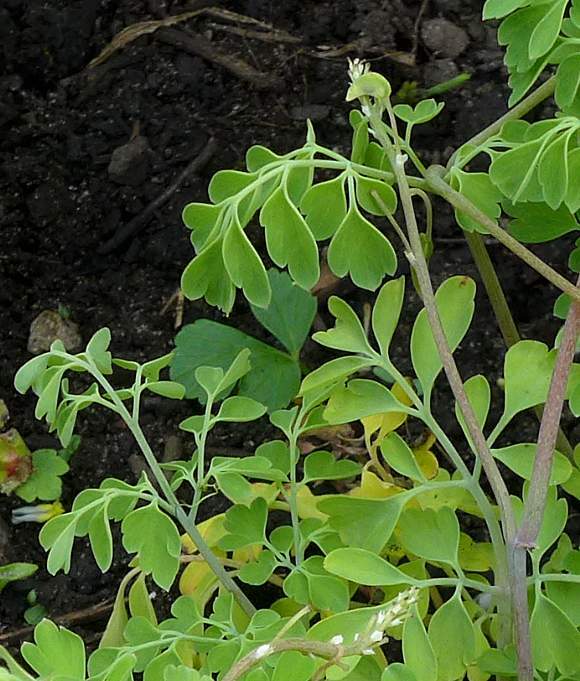 The leaves are in opposite pairs and one could almost suggest they were pinnate, but with very few leaflets. Note the purple-tipped hydathodes at the tips of the lobes. 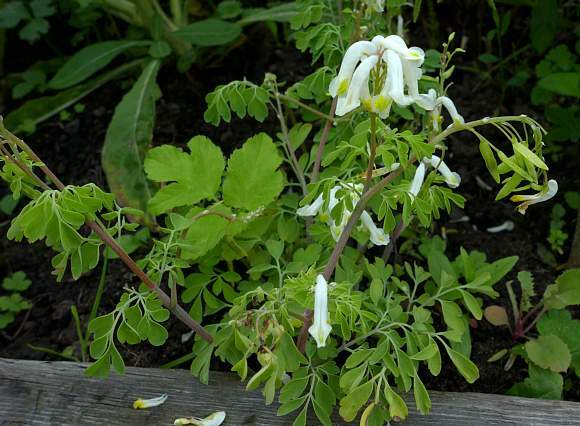 It is a non-native short-lived perennial plant which is planted in gardens. 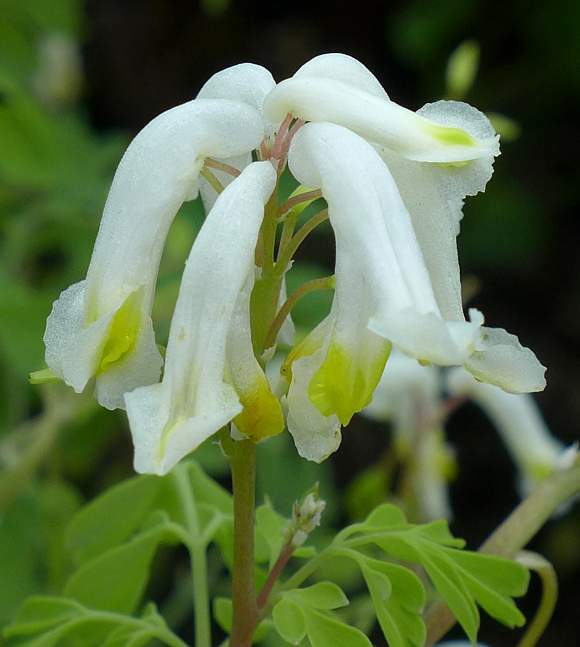 It is not a commonly planted plant and is a slow-grower preferring dappled shade and a moist soil. The leaves often remain through winter. It has a semi-succulent appearance. 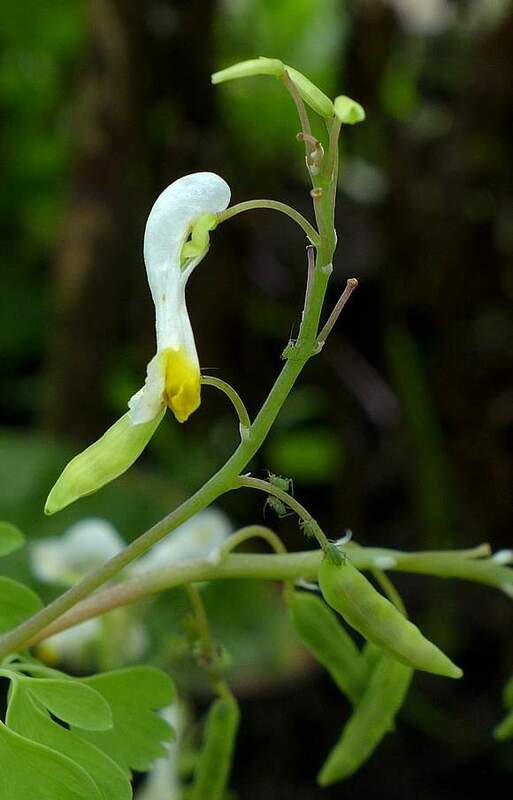 The flowers are borne in racemes on short petioles. The plant is branched.